The Richey family have had a cattle operation on this grass farm for over 35 years. They were immediately drawn to this country property by the beautiful rolling hills and the abundant water sources. The Richeys are now subdividing this large farm; so that other families can share in the joy that they have had in raising their family in a rural community. Join them in living the simple life nestled in the natural beauty of creation. The Richeys have never used herbicides or broadly used insecticides. Bring your family back to nature and have your own Tennessee farm. Raise your own livestock, fruits and vegetables in a community of mini farms protected by covenants prohibiting mobile/modular homes and setting standards for your neighbors so that all can enjoy the good life. Richey Farms contains in total over 700 acres, but has been subdivided to offer mini farms for sale in all sizes from 10 acres to 50 acres. All lots offer wooded as well as pasture land with beautiful house sites and many have their own natural spring water or ponds. 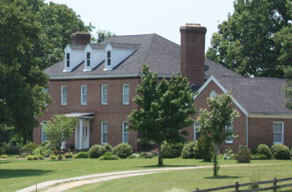 Although Richey Farms is rural, it is convenient to Nashville, Dickson, Leipers Fork, Franklin and Columbia. Centerville, Tennessee is located in Hickman County and offers excellent schools, an airport and a golf course. If you are searching for rural property for sale in middle Tennessee, we would love for you to come visit us. Give us a call and we will be happy to give you a personal tour. Take I-40 W toward Memphis. Take Exit 172 or Exit 152 toward Centerville. Approximately 50 miles from Nashville.